I've been away for a couple of days so here's a little random catch up post. I've been baking. I have an unhealthy addition to pinning all kinds of sweets recipes on pinterest and it gets even more unhealthy when I decide to try them! 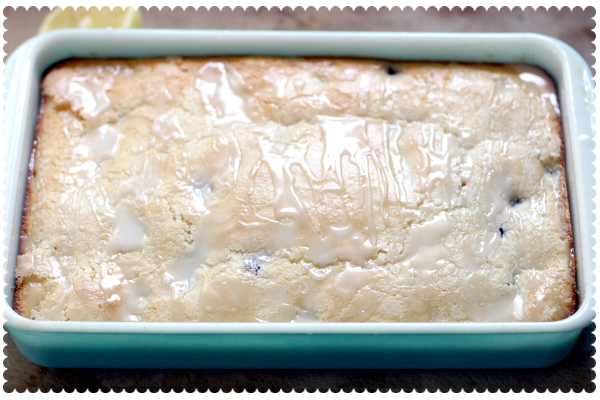 So, this recipe has been on my tasty board and I finally decided to try it. I had to add a lemon glaze though. It was pretty good. Not sure if it's a keeper yet, but pretty good. We had an Indian night a few months ago when some friends introduced us to Indian food. It was so good that I decided we had to have it again. This is a cheapo, cheater version. I'm sure you could find a recipe for tikki masala and make your own, but, I had a $10 gift card to a local Indian restaurant so I got some to-go. I made another one of those "fauxtesserie" chickens. 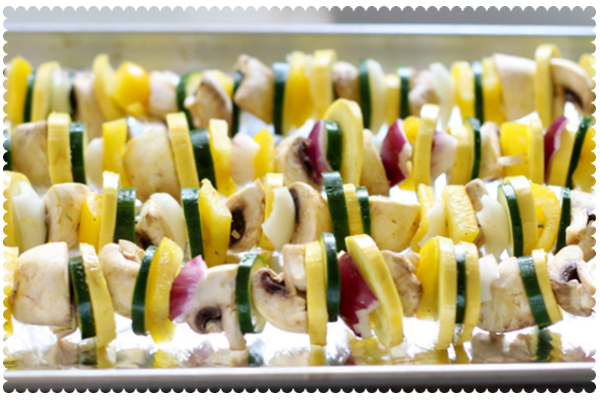 While that was cooking, I assembled some veggie kabobs with zucchini, yellow squash, onion, mushroom and yellow peppers. I poured a little olive oil over the sliced veggies and sprinkled a little curry powder over them and tossed it all around to coat. Then I put the veggies on skewers and broiled them for about 30 minutes, turning a couple times while they were cooking. 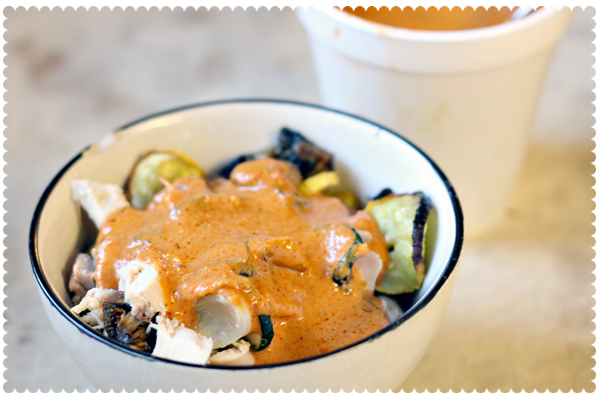 I steamed some brown rice in my handy-dandy steamer, diced up the chicken, topped it with the veggies and then poured hot tikki masala all over it. Mmm. It satisfied my heat-craving and kept the kitchen cool. The whole dinner cost a total of $8.22 which comes to $1.37 per person! That's cheap! I've also been enjoying this summer with my girl. She's been enjoying the cat. 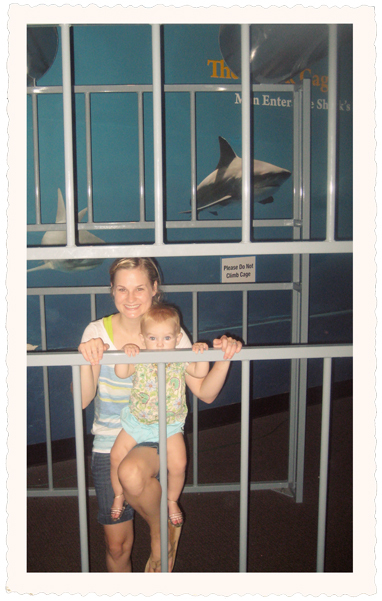 And here's me and my girl in the shark cage at the aquarium for Embrace the Camera. oh my goodness, the pictures of her with the cat? that is awesome. 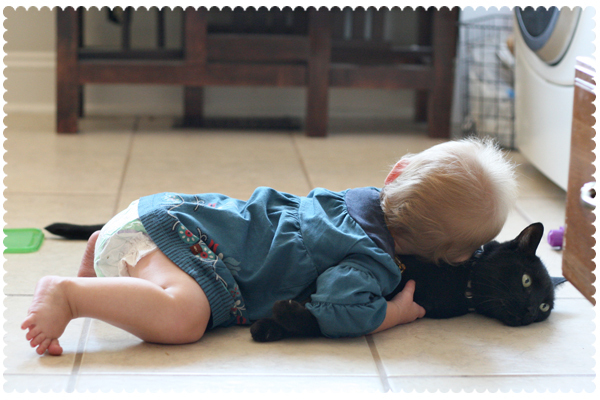 every time I see pictures of a kid and a patient cat I think of the Babies documentary, when the kid drags a cat across the screen by a rope leash. Hilarious. Oh my goodness that sweet cat! Looks like they are the best of friends. Hmm... 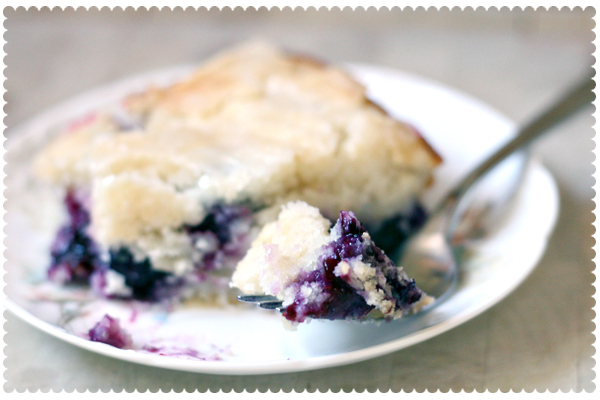 I think I have that same blueberry recipe pinned on my pinterest. And that other recipe sounds delish! Great pictures, Lesley! 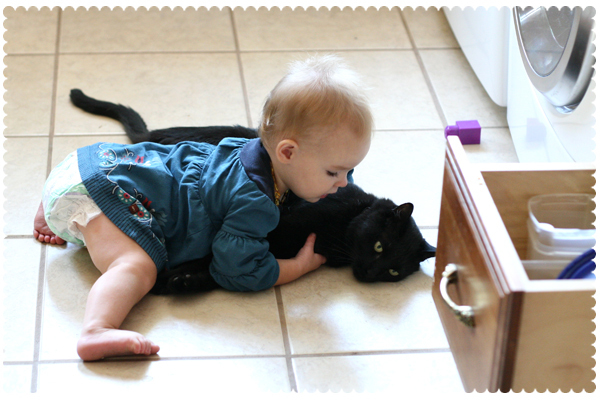 Awww your baby and the cat. Love! And all of that food looks delicious!! Oh YUM! Those all look delish. Those pics of her with the cat are so sweet! And I loveall the food pics. I love to cook and bake, too. Mmm! All of your dishes looks so yummy. And I will agree that you do have the cutest baby! Oh, Lesley. That cat snuggle photo just made my day.